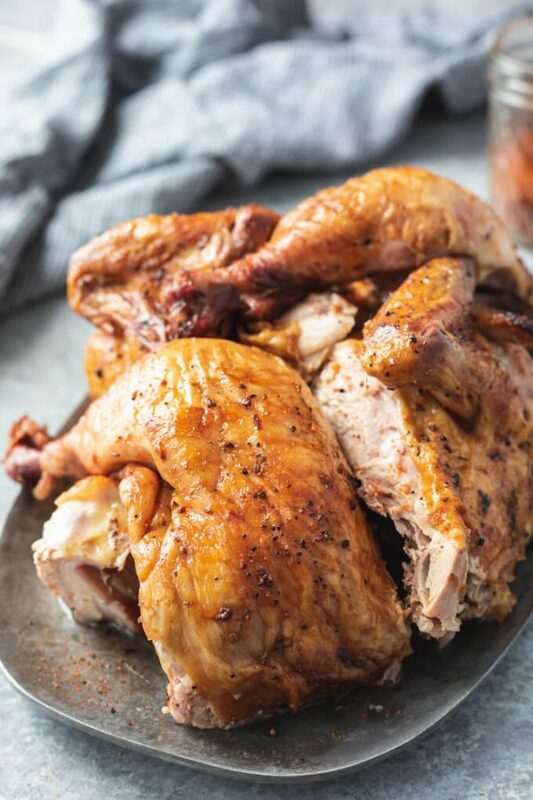 Tender juicy smoke-kissed chicken with a sweet-spicy rub cooked on a grill is one of life’s many pleasures. 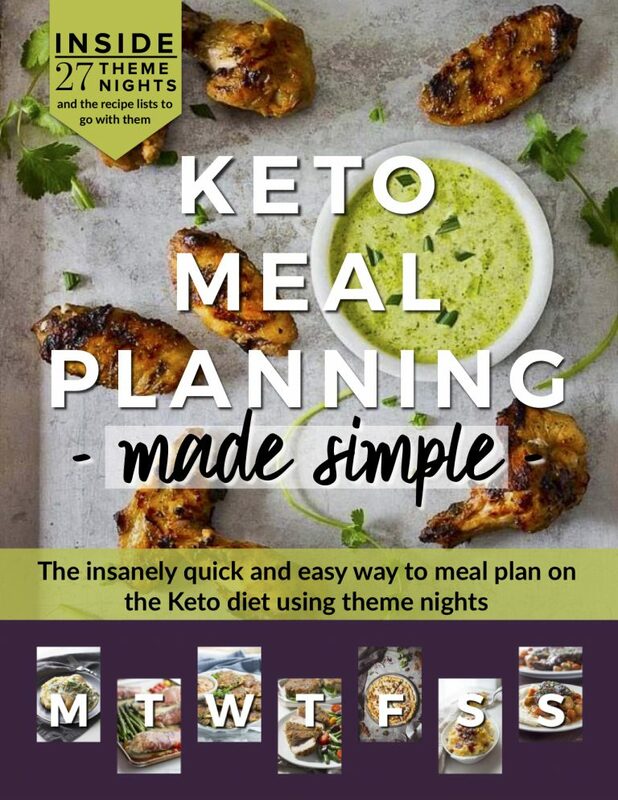 This recipe is sugar-free and perfect for low carb keto diets. THIS POST SHARES LINKS TO THE THINGS I LOVE. 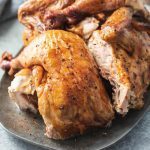 It’s finally football season and there’s nothing tastier than a nice piece of smoked beer can chicken to eat while watching the game or tailgating with friends! Beer can chicken has been around for more than 20 years and is still a popular dish. 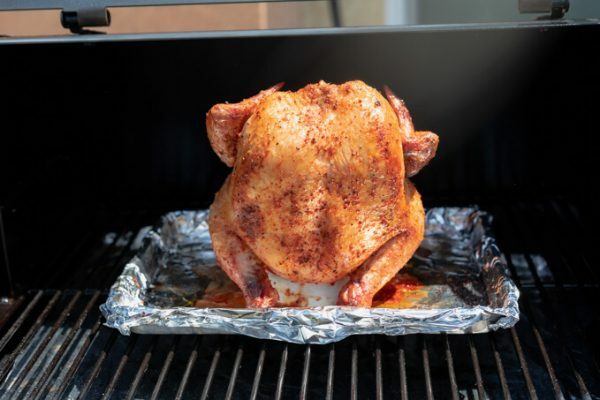 One reason for its popularity is that you can cook a beer can chicken in the oven, on a gas grill, on a charcoal grill or on a pellet grill/smoker. Whatever method is employed, the chicken is always flavorful, tender, and juicy. 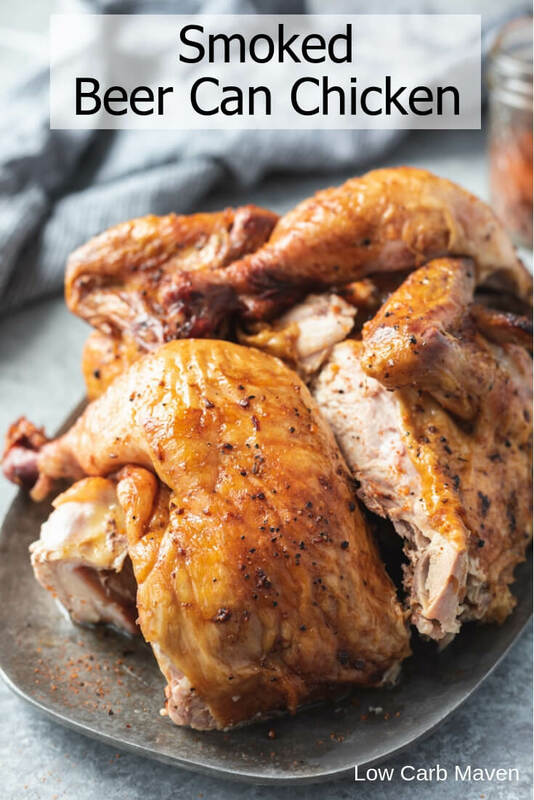 I first heard about beer can chicken when I received my first grilling book – Steven Raichlin’s, “How To Grill”. He is credited as the inventor of the original tasty recipe. His book is awesome and a gateway to his newer book, “Project Smoke”, which is the ultimate guide on how to smoke. It’s a must have for those who are interested in getting the most flavor out of their backyard smokers. I’ve made beer can chicken on my gas grill before and it was easy. But, the acquisition of a Traeger Pellet Grill was a game-changer! We are obsessed with backyard smoking and want to smoke all the things! And, smoked beer can chicken is amazing. What is beer can chicken? Beer can chicken is generally smoked but if you have a gas grill you can use a smoker box to achieve that characteristic smokey flavor. When I lived in Texas, my dad used to add soaked mesquite pods to the charcoal briquettes on his grill to get a smoky flavor. It was awesome. We kids would fight about who’s turn it was to throw on the next handful. I like a sweet and spicy rub for beer can chicken. 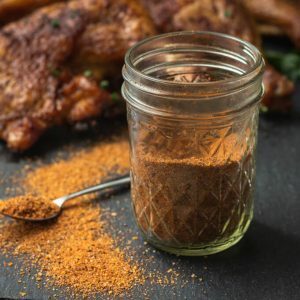 My favorite beer can chicken rub is my BBQ dry rub for chicken and pork. You can also use lemon pepper or any other good tasting rub. 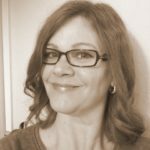 My husband likes a good cajun rub and has also used Old Bay Seasoning before, too. To prepare the chicken, remove the gross bits in the cavity. Dry the chicken with paper towels, inside and out. 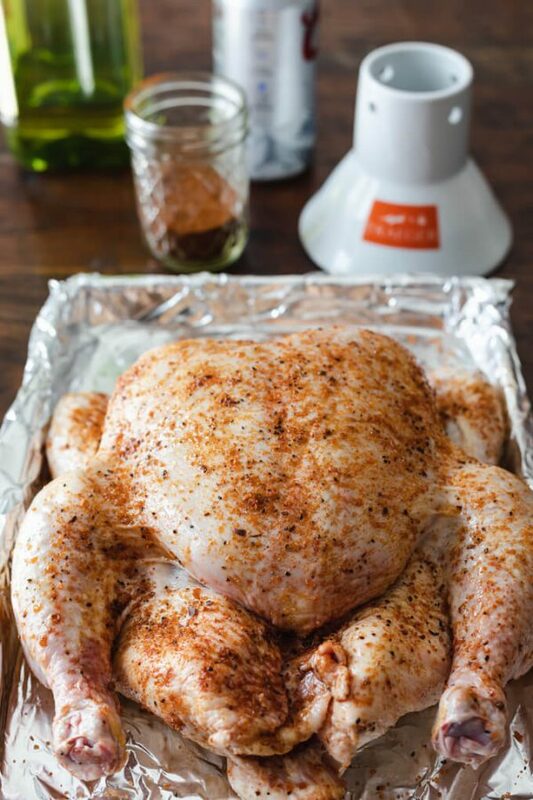 Rub oil on the entire outside of the bird – don’t forget under/around the legs and wings. Season the whole bird, inside and out, with your favorite dry rub. I add a little more salt unless the rub is salty. I don’t drink beer, so I pour out a little beer out of the can and then add 1-2 teaspoons of my seasoning rub to what’s left. Place the beer can up into the chicken cavity so the chicken is standing up. Sometimes, the chicken doesn’t want to stand up so I use a more stable ceramic beer chicken base instead of a beer can. I use a Traeger Chicken Throne and I love it because my chicken doesn’t fall over! Bend the wings back behind the body, like you would to prepare a roast chicken, so they don’t burn. I place the chicken on a tray and put it my pellet grill. The tray provides a little extra stability but it’s not required. After preheating, I set my pellet grill to 350 degrees. When it reaches temperature, I cook for 1 – 1 ½ hours or until the thickest part of the thigh reaches 165 degrees. Make sure to let the chicken rest uncovered for at least 15 minutes before enjoying. 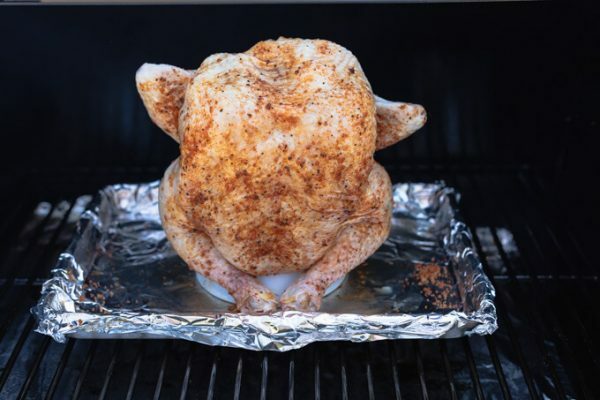 If tented lightly with foil, it will stay hot for over an hour, although the skin will soften. The time will vary depending on how big your chicken is and how many you are smoking at once. If you are smoking one, you might as well do two! I absolutely LOVE smoking beer can chicken on my pellet grill! Turn on one side of the grill. When the grill reaches 350 degrees F, put the chicken on the other side of the grill to cook indirectly. Cook about 1 – 1 ½ hours or until the thickest part in thigh registers 165 degrees on an instant read thermometer. Let the chicken rest uncovered for at least 15 minutes before enjoying. If tented lightly with foil, it will stay hot for over an hour. You can buy a smoker box for your gas grill to get a nice smoke flavor on the chicken. I did this for years. You can cook beer can chicken in the oven. It’s not exactly the same, but it’s still pretty darn good. Move the oven rack down to the lower third or bottom rack depending on the size of your oven. You may want to rub/brush a little liquid smoke on your bird before running in oil and with the dry rub to add that smoky flavor. Prepare the chicken as mentioned above, place it standing up on a cookie sheet. Bake at 350 for 1 – 1 ½ hour or until the thickest part of the thigh registers 165 on your oven thermometer. What if You Don’t Drink Beer? Beer Can Chicken Without Beer! Make soda chicken! If you don’t drink beer you can still use this technique to make chicken. I suggest using a can of sprite, coke, ginger-ale or rootbeer. Make sure to use the real thing (with sugar). Heating diet sodas can change the chemical composition of some artificial sweetener to something unsafe. The contents of the can don’t really get on the meat (although there can be a little steam that flavors the cavity), but I understand that not everyone buys alcoholic beverages. Pellet Grill: Turn the pellet grill to smoke and let it catch (4 or 5 minutes). Turn the dial to 350 degrees F and let it preheat for 10 minutes. Gas Grill: If using a gas grill turn one side on and let the whole grill preheat to 350 degrees F. Oven: Turn the oven to 350 degrees F and adjust rack to the lower third for a standing oven or the lowest rack for a small wall oven. Remove the chicken bits from the cavity. Dry the chicken well, with paper towels. Rub a thin layer of oil onto the entire outer surface of the chicken. Liberally sprinkle the dry rub on the chicken. If your rub is not salty, add a little salt, too. Bend the wings behind the bird, like you would when roasting a chicken, to prevent the wing tips from burning. Pour-out or drink half of the liquid in the beer can or fill a chicken throne half way. Add 2 teaspoons of dry rub to the liquid. Carefully place the can into the chicken cavity so that the chicken stays upright. If you push it all the way up, the chicken may not balance. That's why I love my stable chicken throne! 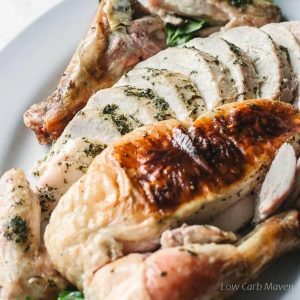 Put the chicken on a sheet pan and place it onto the grill grate. The sheet pan makes it easier to move the hot chicken once it's done. Cook for 1 - 1 1/2 hours or until the thickest part of the chicken thigh reads 165 degrees F on an instant read thermometer. Let the chicken rest for at least 15 minutes before enjoying. Alternately, tend lightly with foil and it will stay hot for at least an hour. After resting, remove the can or chicken throne. Turn the chicken over and cut the back lengthwise through bone with kitchen sheers or a sharp chef's knife. Flip the chicken over, spread out the sides of the chicken best you can and cut straight down along the breast bone to divide the chicken in half. Serves 4-6 people depending on how big the chicken is and how you cut it. Cut the halves crosswise, separating breasts from legs. This serves 4. Separating the legs from the thighs will serve 6. NOTE: Nutritional values reflect a whole leg piece with skin. 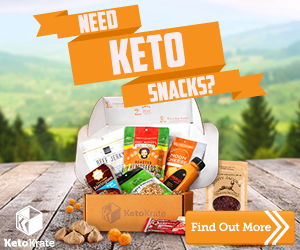 I used the nutritional numbers for a rotisserie chicken leg from Fatsecret. 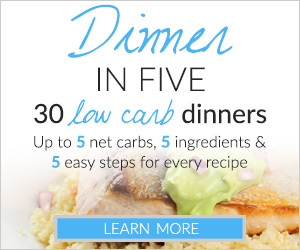 If you remove the skin, the chicken has zero carbs. A piece of chicken breast will have more protein and less fat then a leg. Reheat leftover chicken in the microwave or cover with foil and reheat in the oven at 325 for 20-30 minutes. This looks so good! Perfect for a BBQ. I can’t wait to try this.